On Saturday, October 26, 2019, reenactors will closely follow the historical movements of the troops Generals Sherman and Wheeler. 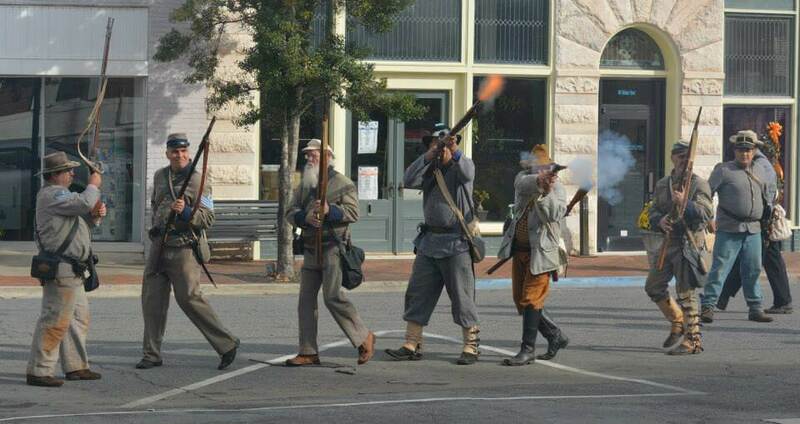 Union troops will advance on West Church Street (Highway 24) from the West, and the Confederate troops will attempt resistance on the downtown Courthouse Square. The Union march will begin very early Saturday morning. The Courthouse Square battle will commence at approximately 10:00 am. Infantry, cavalry, and artillery will be represented. Be on the lookout for snipers! It is very important for spectators to remain in the spectator line at all times. The troops are moving very quickly. While no ammunition is used, the guns and artillery are using gunpowder, so the area will be smoky and loud during the battle. After the battle has ended, reenactors and the public may gather closer to the Bandstand. Vignettes of historical details will be presented. Only permitted photographers will be admitted in the staging area. West Church Street will be closed from 8:00 am until 10:30 am. Drivers are encouraged to plan alternate routes. West Church Street residents are invited to participate in the event by offering the troops light refreshments. If you would like to participate, place a Blue Ribbon in a conspicuous place to be seen by the troops. These are available from any local florist. Be prepared for the “bummers’, though, as they will be bringing their appetites!